Belize has in place an informal moratorium on offshore drilling for petroleum, but some environmental groups in Belize insist that the country should never venture into such risky explorations, particularly in light of the fact that Belize’s Barrier Reef and its associated wonders – including the Great Blue Hole – could be threatened in the event of an unthinkable oil disaster. A petition led by the Belize Coalition to Save Our Natural Heritage for a national referendum on offshore drilling was blocked when the petition was denied on the claim that 8,000 signatures had to be rejected, primarily because of mismatches. However, the Coalition held its own referendum, observed by Justices of the Peace, in which 96% of the nearly 30,000 who cast ballots said ‘no’ to offshore drilling. The Government of Belize, though, is of the view that “an effective balance” can be struck between oil development and the environment, in a manner that will ensure that the livelihoods of other stakeholder groups from the fishing and tourism industries will be maintained. This view is reflected in the draft Petroleum Exploration Zones and Exploration Guidelines for Belize, released to stakeholders this week, incidentally on the occasion of a visit by a delegation from the World Heritage Centre here in Belize. Amandala has had a chance to review the draft Petroleum Exploration Zones and Exploration Guidelines, and it is based on the premise that under law, all of Belize – whether occupied by landowners, schools, business, churches, farms or even rare natural wonders – can be parceled out in petroleum concessions. 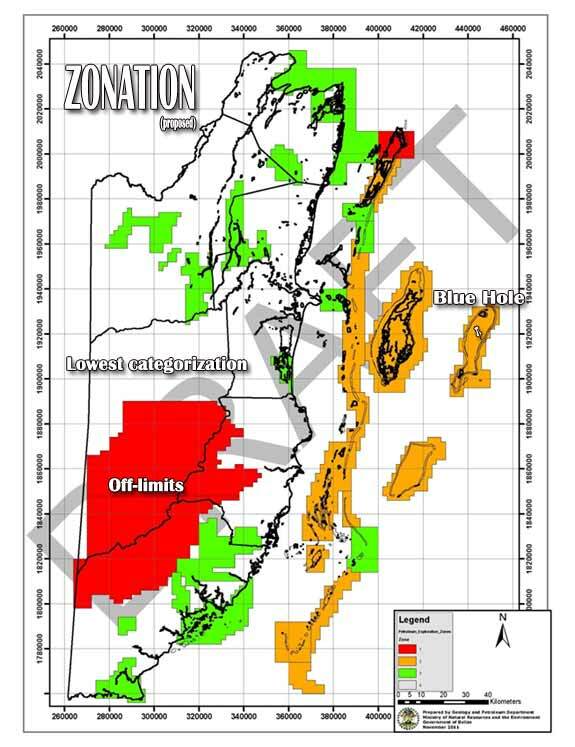 However, the plan sets out to break up the territory of Belize into four zones: zone 1, where no petroleum exploration is to be allowed, and zones 2 to 4, where petroleum exploration would be allowed with varying degrees of restrictions and guidelines, ranked based on priority level. The only areas listed as zone 1, where exploration would be banned, is the area known as the Maya Mountain Massif, home to 14 protected areas, as well as the area of north Ambergris Caye, which we understand includes Bacalar Chico. Most of the country is listed as zone 4, the lowest classification, and appears shaded in white. Zone 1 also includes most of offshore Belize, whereas the atolls and cayes offshore are shaded a mustard yellow and listed as zone 2, the areas where exploration would be allowed with maximum restrictions. Concerns have been raised that the Blue Hole is included in the area shaded as zone 2, which means that in principle, based on the current classification, drilling could be allowed there. However, we note that currently no company has a contract to explore for oil in the Blue Hole. The most recent concession map shows that the company which had been given a contract covering the Blue Hole, Princess Petroleum, had relinquished that area, although it retains a concession over adjacent waters. The Sarstoon Temash Institute for Indigenous Management (SATIIM) says no to an oil framework without a coherent development policy. “With the plummet of oil prices, exploration projects all over the world are being put on hold – what’s the rush in Belize?” SATIIM questioned. The NGO said that it is calling first for the creation of a comprehensive policy on sustainable development. It added that, “Without a comprehensive, coherent development policy, government agencies regularly contradict each other. On one hand, protection of our natural resources is important for tourism; on the other, it’s ‘Drill, Prime Minister Drill’,” SATIIM said in its statement. The NGO said that its experience with oil drilling in southern Toledo is that frameworks do not enforce oversight, compliance and monitoring of the various departments involved. “While the drilling may have stopped (though no official announcement has been made) with the site being backfilled, poisonous gas leaks are being reported in the villages – with no government monitoring. 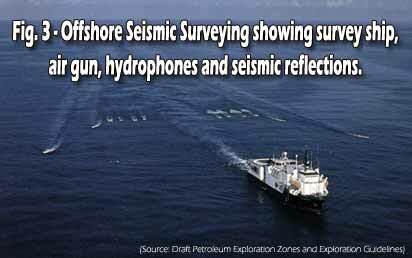 What can we expect from drilling off our coast?” SATIIM commented. The Coalition explained that the mission comes five years after the site was placed on the list of sites in danger and at least one on-site review was done to check the progress of Government’s corrective actions. “Pointedly, oil concessions within the World Heritage Site aided in Belize’s Barrier Reef Reserve World Heritage Site being demoted to a list of World Heritage Sites in Danger,” the Coalition noted. It is asking the Government not to issue new offshore oil concessions; not to give any extensions to the three companies presently holding offshore oil leases; and to allow the relinquishment process to take effect as the Petroleum Act stipulates. It is also calling on the Government to legislate the restrictions on offshore drilling. Whereas some civil society and NGO groups have expressed concerns that the Government has not properly consulted before producing the draft document, a press release issued Wednesday by the Ministry of Energy, Science & Technology and Public Utilities says that this is the Ministry’s second attempt to solicit feedback from the NGO community on the revised zonation plan and exploration guidelines. “In September 2014, the Geology and Petroleum Department (GPD) shared the zonation plan and framework with 13 stakeholder groups, inclusive of Belize Coalition to Save Our Natural Heritage, APAMO and other public and private sector entities. Subsequently, the GPD received feedback only from APAMO, the CZMAI, the Belize Coalition to Save Our Natural Heritage and one petroleum company,” the release added. Back in 2011, we reported that the Government was considering putting into effect a zoning scheme for petroleum exploration. The Government had also indicated that it would retain the moratorium on offshore drilling and the issuance of new offshore contracts until this matter is resolved. From the outset of the process, we had reported that the only two areas that were proposed as off-limits were the Maya Mountain Massif and a portion of the Corozal Bay area. Today, Dr. Colin Young, CEO in the Ministry of Energy, Science & Technology and Public Utilities, told our newspaper that the consultations on the draft zonation framework are far from over. “This document, it’s a tool that is being developed by the Ministry in consultation with stakeholders – both the public and private sector and civil society, and it’s in this spirit that the ministry is once again sharing these petroleum guidelines, to solicit feedback, particularly scientific data in the possession of civil society groups, NGOs and academia so we can improve the robustness of the plan,” he said. Young underscored that the document does not constitute a policy document. He told us that the zonation scheme may, in fact, change, depending on the scientific data the ministry receives from the stakeholders. “It is not intended to provide a compendium on do’s and don’ts, of the potential benefits and impacts of exploration onshore or offshore,” Young said. He said that the document is a planning tool, and the Ministry wants to utilize all available evidence and data that will then allow the department to make a decision and recommendations to Cabinet on the potential areas for petroleum concessions. Young explained that the Ministry will be accepting feedback until March 2015 on the Petroleum Exploration Zones and Exploration Guidelines. He said that the resulting recommendations would inform a Cabinet paper which would present all the technical information to Cabinet – the body which makes the policy decisions. Young noted that the Government has, in line with the moratorium commitment, not issued any new offshore concessions, and they have also asked concessionaires to relinquish more than the contracts stipulate. He noted that Princess Petroleum has already relinquished its acreages over the Blue Hole. He said that if and when the Government decides it wants to proceed with drilling in a particular zone, all the environmental laws and all the Environmental Impact Assessment requirements will come into play. He said that after they have received feedback on the draft guidelines, they will compile everything and invite all stakeholders to a consultation session, in order to improve the guidelines.